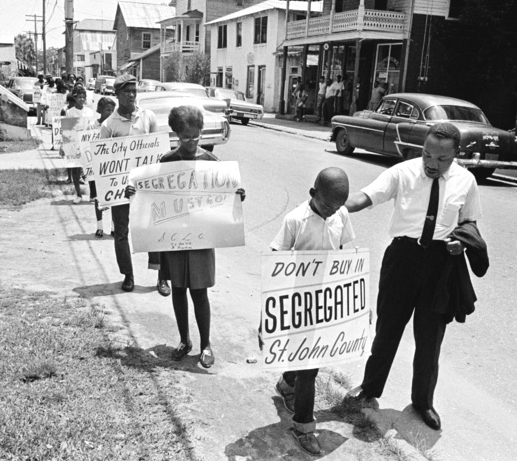 Dr. King with young pickets. 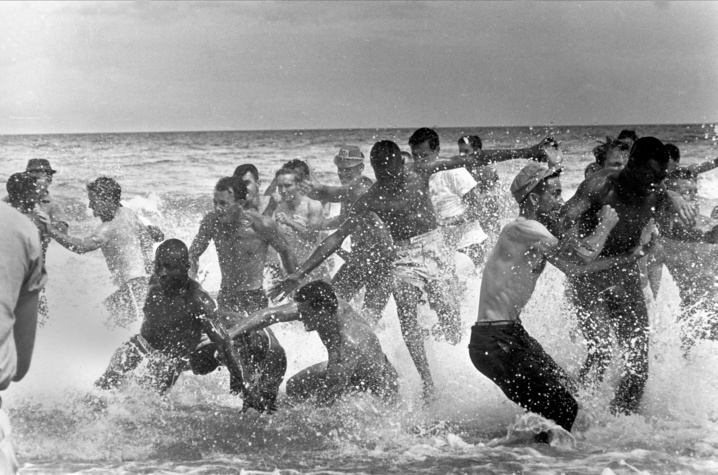 June, 1964. 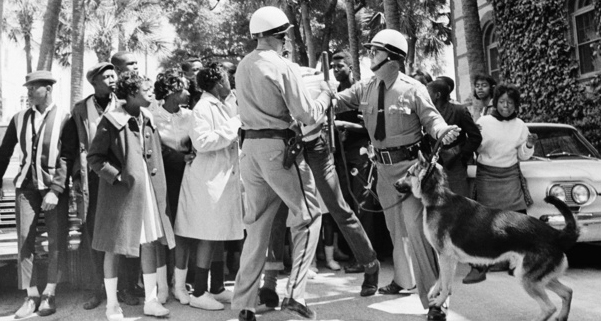 Chief of Police Stuart confronting pickets at the Old Slave Market — one of St. Augustine's tourist "attractions." 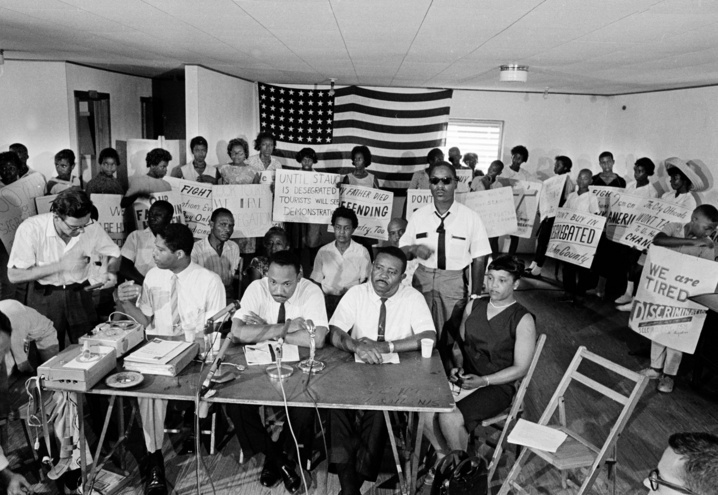 Dr. Hayling, Dr. King, Rev. 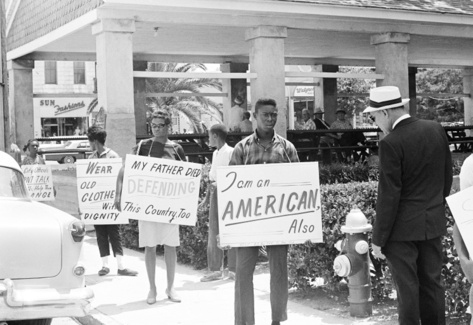 Abernathy, and young protesters call for an immediate end to segregation in St. Augustine. "This was about the roughest city we've had  45 straight nights of beatings and intimidation. In church every night we'd see people sitting there with bandages on. Some would sit with shotguns between their legs. We sang before we went out to get up our courage. 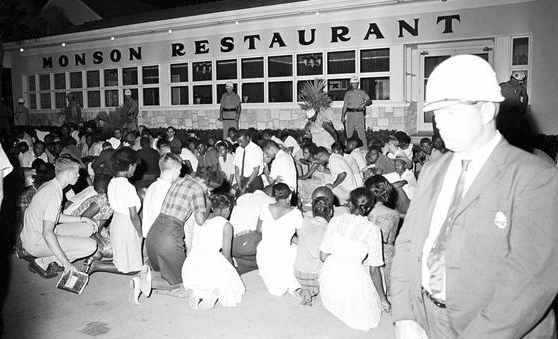 The Klan was always waiting for us  these folk with the chains and bricks and things." 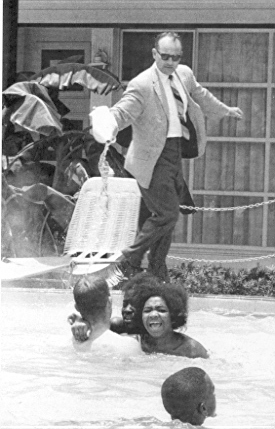  Dorothy Cotton, SCLC. 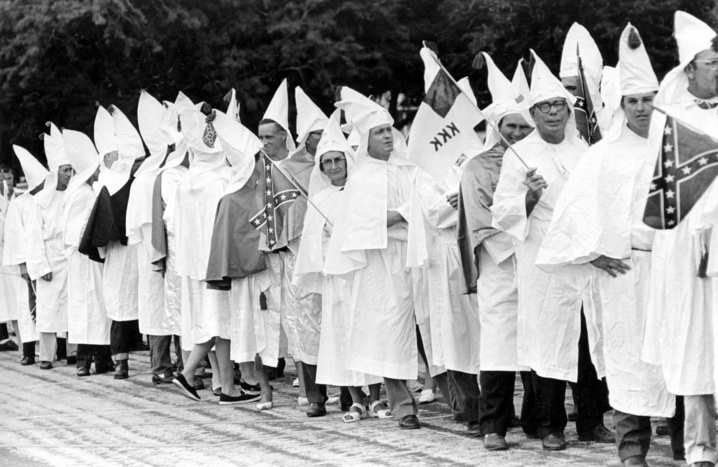 The KKK mobilizes in St. Augustine to suppress the Freedom Movement with fist, clubs, whips, guns, and bombs. 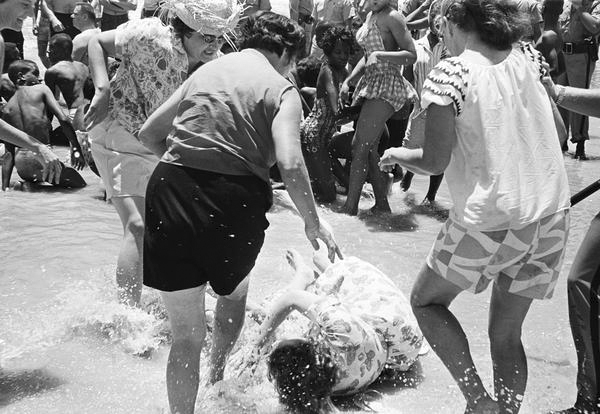 Whites attack anyone attempting to integrate one of St. Augustine's "white only" beaches. "I remember the wade-ins because the bump hasn't gone off my jaw yet. They started yelling obscenities at us, but we went on  myself and a group of teen-age girls. We were afraid, but we felt we just had to go on."  Dorothy Cotton, SCLC. Rev. 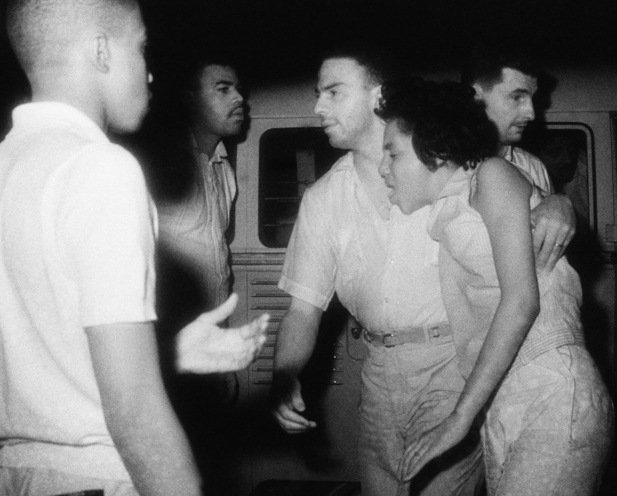 Andrew Young (SCLC) aids a woman injured when the KKK attacks marchers. Protesters return to church after confronting the Klan. Cops halt freedom march, arresting scores. Hundreds are arrested as protests continue. Still singing their freedom songs, arrested protesters come out of paddy-wagon on way to the makeshift, outdoor "chicken-coop" prison. 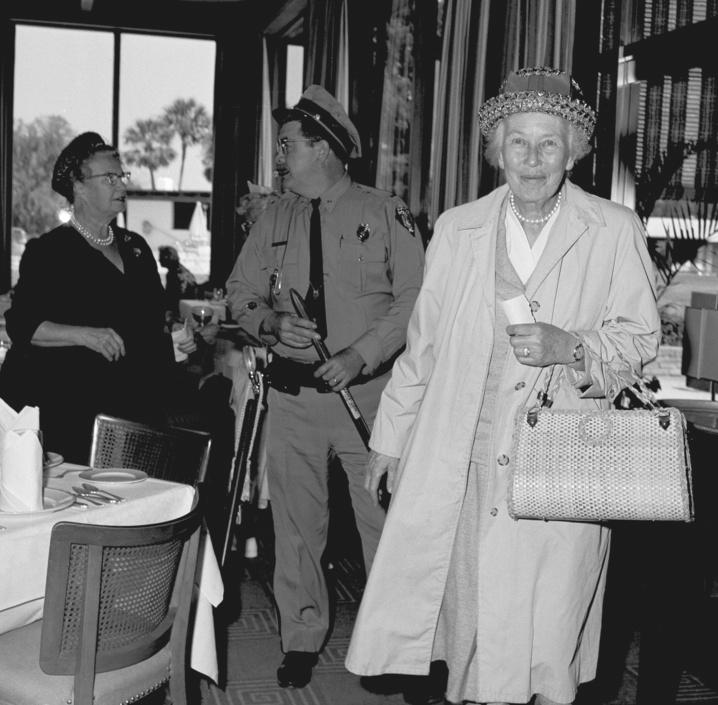 Among those arrested for sitting-in is Mrs. Mary Peabody, mother of Massachusetts Governor Endicott Peabody. 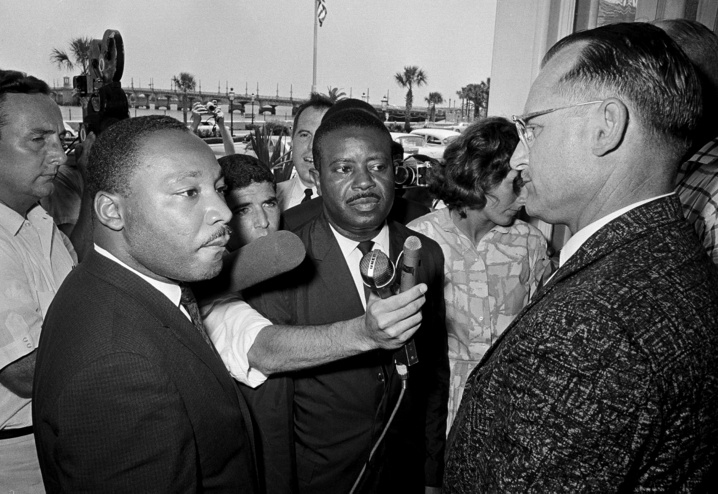 Dr. King and Rev. Abernathy confront James Brock of the Monson Motel & Restaurant. They and a number of other protesters are arrested for the crime of attempting to order lunch. Spanish translation of this page.